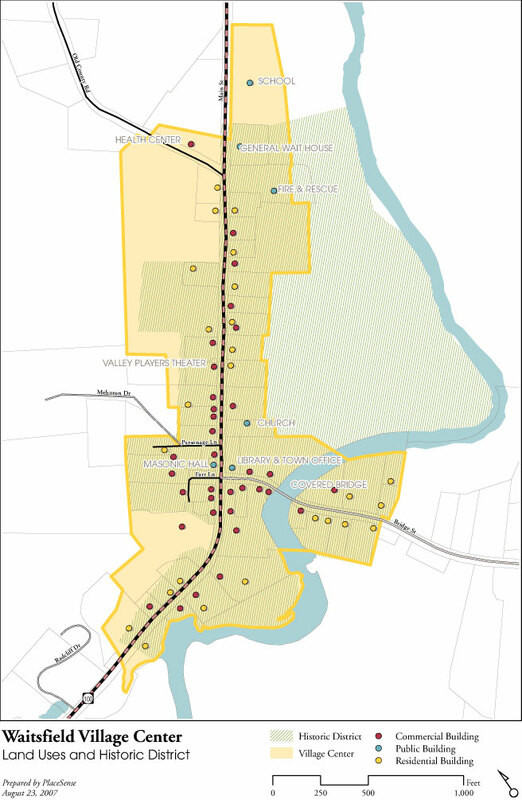 The Town of Waitsfield's application to the Vermont Downtown Board for Village Center Designation was approved on Monday, September 24, 2007. This was made possible with the support and assistance of Smart Growth Vermont, the Central Vermont Regional Planning Commission, PlaceSense, and the Mad River Planning District. This approval will need to be renewed in five years. Village center designation was created by the legislature as a outgrowth of the successful Downtown Program to recognize and encourage local efforts to revitalize Vermont’s traditional village centers. It is one of many tools available to help improve Waitsfield's vitality and livability and focuses on supporting commercial activity in the village center. The boundary largely coincides with Waitsfield's Village Residential and Village Business zoning districts and includes the Waitsfield Village National Register Historic District. 10% State Historic Rehabilitation Tax Credit - This credit applies to the costs for substantially rehabilitating a certified historic building and piggy-backs on to the 20% Federal Rehabilitation Investment Tax Credit. All building-related rehabilitation costs are eligible, including exterior and interior improvements and code compliance. The first $500,000 in costs receives a 10% credit along with half the costs over $500,000. 25% Facade Improvement Tax Credit - This credit applies to the rehabilitation of a building facade. Maximum award is $25,000. It cannot be used for a building that is eligible under the 10% Historic Rehabilitation credit above. 50% Code Improvement Tax Credit - This credit applies to the costs of bringing a building into compliance with state building codes, to abate hazardous materials, or to redevelop a contaminated property. It includes a maximum award of $12,000 for a platform lift, $50,000 for sprinkler systems, $50,000 for elevators, and $25,000 for the combined costs of all other qualified code improvements, as well as costs for hazardous material abatement and contamined sites redevelopment. This credit may be used in conjunction with the other two credits, as long as the applicant does not request credits more than once on an eligible expenditure (in other words, no double-dipping). Priority Consideration for Grant Programs - The State's Municipal Planning Grant Program and Consolidated Plan for HUD funding, incuding the Community Development Block Grant (CDBG) Program will give designated village centers a priority consideration for all grants. Priority Consideration for BGS - The State Department of Buildings and General Services will give consideration and priority to designated village center locations when leasing or constructing buildings, in consultation with the community. Special Assessment District - A Special Assessment District in a designated village center may use funds for operating costs in addition to capital expenses.